High Point Auto Salvage, Inc. Whether your car was totaled in a severe accident, or you’ve decided to junk your old truck that’s rusting in the driveway, it isn’t unusual for drivers to wonder what happens after their vehicle goes to the salvage yard. As the recycling and crushing team at High Point Auto Salvage in Guilford County, NC, explains, what happens after the tow truck takes your car away benefits other car owners and helps protect the environment in surprising ways. Though the vehicle itself might be beyond repair, many of its individual parts can still be reused for other vehicles. As a result, scrapped cars aren’t going to be sent to the crusher right away. Instead, salvage workers will inspect the car to find any usable parts. Everything from brakes to body panels can be reused, as long as they are in good condition. Due to the inherent value of these parts, drivers who sell their scrapped vehicles are often reimbursed based on the vehicle’s condition. More usable parts can yield more cash for your old car. Even seemingly unusable components can still be reused thanks to the recycling and crushing process. For example, the rubber from old tires is often recycled to make new tires or playground surfaces. Steel is melted down and reformed without losing any of its inherent performance capabilities. Even car batteries can be recycled. The recycling of these raw materials reduces water and air pollution by limiting the energy impact of mining and other production methods. By reusing these valuable materials, recycling and crushing your old vehicle can make a big difference for our planet. 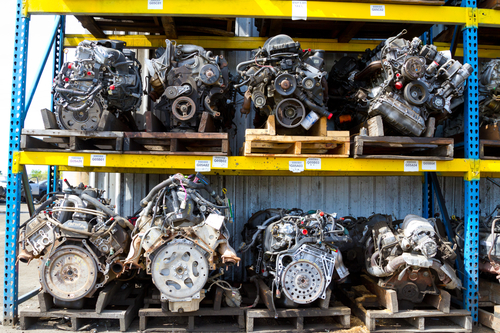 Whether you wish to recycle an old vehicle or are in the market for used auto parts in the Piedmont Triad region, you can trust High Point Auto Salvage to provide quality service. To learn more about what this auto salvage yard can do for you, including their recycling and crushing services, visit them online or call (336) 889-9062. Other Announcements, Events and Deals from High Point Auto Salvage, Inc.
A. High Point Auto Salvage, Inc.